Our vision is to develop a multidisciplinary research in the field of ceramics and glasses for energy applications, life sciences and environmental sustainability with this addressing the global megatrends of individualized medicine, materials scarcity, environmental protection, and the need for clean energy. 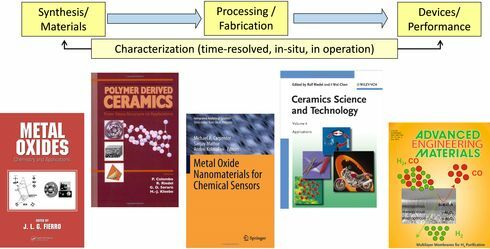 In our research we access all important stages in the development of materials and devices, from their birth and life to their degradation and death. Our strength is in the design of different material classes with the targeted properties, followed by their synthesis and processing under the controlled conditions. The latter are achieved by applying a variety of structural and spectroscopic characterization techniques in the in-situ and in-operando conditions that allows us to address the crystallization, phase transitions and functional properties of the materials and devices we are developing. Over the last two years the research focus Materials for Additive Manufacturing has been established at the Chair, through support within the framework of the Strategic Call “Jahreskonzept 2017” of TU Berlin, and constitutes nowadays one of the core focal points of ongoing research and teaching activities at the Chair. We are engaged with multiple aspects of additive manufacturing processes, including (i) the development of manufacturing processes for the processing of metallic, ceramic and polymeric materials and their composites for laser sintering, (ii) the stereolithographic and FDM (Fused Deposition Modeling) method with filled photocurable pastes and slips, (iii) the fabrication of carbon fiber reinforced filaments for the FDM process and (iv) additive manufacturing processes with polymer-derived ceramics.